Come back later this week to check out your regularly scheduled 'Wess Reads Comics' to see what Wess is reading this week! Whenever Scott Snyder announces a new project he's working on, my interest is automatically piqued. He could announce that he'll be the newest writer on the Yellow Pages and that would make me stop throwing them in the recycling bin. No matter the content, Snyder has a way of bringing a maturity and complexness to any topic in a way that it makes you reflect and hold a mirror up to your own life. 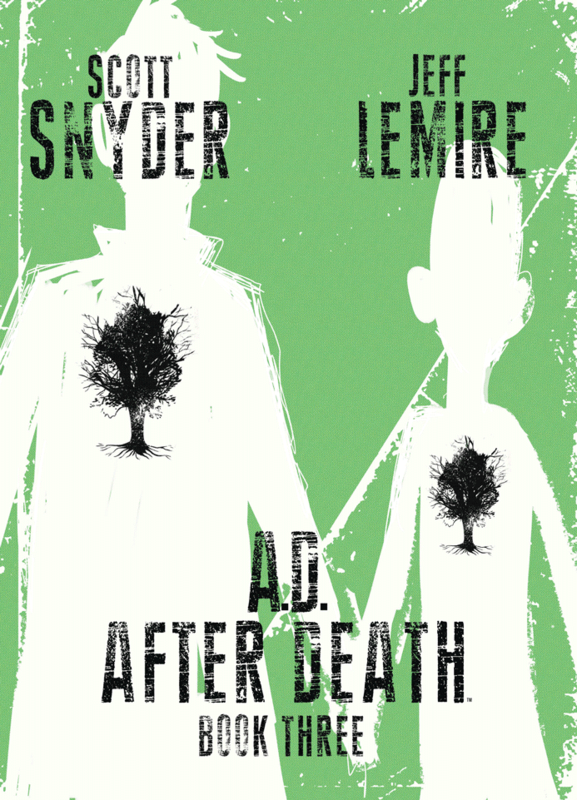 A.D. After Death is no different, and Book 3 brings the entire narrative to such an incredible and surprising conclusion that most people, myself included, would have never seen coming. Whenever an author decides to write a story that involves touching on multiple points in time in a person's life, it can get a little convoluted or hard to follow. However, he and Jeff Lemire have done an incredible job of instantly changing the mood of the book, not just by the words and the incredible artwork, but by the ingenious way the book is laid out and pieced together. The combination of graphic art and prose works as a wonderful contrast that allows the reader to get their bearings when jumping from one time to another. One of the things I love about A.D. is trying to figure out how the events of the past could be tied to the events of the future. Book 3 continues to round out Jonah Cooke's character by bringing in key moments from his past that ultimately shape and influence his decisions in the future. And while some of them may seem only loosely connected, they aren't. They are pivotal moments that act as either turning points or anchors in Jonah's very, very long life. When I finished reading it, I was left with the question of: "If I could live forever, what are the moments that I would want to stay with me throughout my life?" And that's where Snyder's writing really shines. The ability to cause to question yourself, your choices, and sometimes your reality. His prose paired with Jeff Lemire's incredibly fitting artwork are a perfect marriage and make this a work that will stand the test of time and be remembered for years to come. Do yourself a favor and read this book.